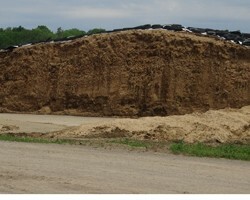 A farm business owner can examine how much corn silage he/she would be willing to supply to a market at a given price. Analysis of the farm business' cost structure for corn silage production combined with consideration of other factors help to define the supply relationship. A seller can develop a target based upon the above, but actual market conditions provide no guarantee that a buyer will purchase quantities desired at a price that achieves the producer's cost target. Some farm business owners might approach the problem of determining corn silage price from a value in production, or input demand perspective. Amounts of corn grain and corn stover in a ton of corn silage, relevant prices, and corn silage's place in the milk production process are key variables. A buyer can develop a price target based upon the above, but actual market conditions provide no guarantee that a producer will sell the quantity desired at a price that matches the buyer's willingness to pay. Although factors in price determination, the two approaches described above in isolation, don't completely determine price and quantity. Supply and demand relationships work simultaneously in markets to determine price and quantity. Empirical price analysis brings supply and demand relationships together to determine price. Empirical price analysis suggests that corn silage price is a function of corn silage quantities, alfalfa hay price, the price received by farmers for milk sold, and corn grain price. The ordinary least squares regression model here expresses corn silage price as a linear function of the above variables. The analysis is somewhat rough, elementary. However, readers of the original August 2012 article describing this work and readers of annual update articles note that the analysis and estimates generated help farm business owners price corn silage. The ordinary least squares regression model reported in August 2012, updated here to reflect additional data available to date and changes in other underlying factors, including NYS drought conditions for 2016, produced corn silage price estimates for NY. Below, estimated corn silage price is a function of alfalfa hay price and corn grain price with other factors (corn silage production and milk price) fixed at expected levels. Expected corn silage quantity is set at 7,597,000 tons, 1 standard deviation below the average of 8,214,000 tons for the period 1991 through 2014. During this period, 16 percent of production observations fell below 7,597,000. Using the estimating equation and the above prices for alfalfa hay and corn grain, estimated corn silage price is about $60 per ton. Compare this to last fall's estimate of about $50 per ton. Suppose alfalfa hay price is $200 per ton and expected statewide corn silage production is 7,906,000 tons, 0.5 standard deviations below the mean. Then, estimated corn silage price would be $56 per ton. Buyers and sellers use an estimate as a base, typically, adjusting for quality and, or costs for harvest, hauling and storage based upon the situation, for example, when pricing standing corn for silage. Corn silage price estimates combined with understanding of relevant supply and demand factors from the individual farm business owner's perspective, including local conditions, for example, effects of drought which can be local in nature, can aid decision making regarding corn silage price.